1. Vodka has disinfectant properties. Vodka is a natural disinfectant and antiseptic. It has been used to treat toothaches, clean wounds, and clean your house, though you probably shouldn't swap it out for your regular household disinfectant. 2. It can relieve stress. You may have heard that red wine is a natural relaxer, but it's nothing compared to vodka, which has been scientifically proven to relieve tension better than vino. Vodka can increase blood-flow and circulation in your body which can prevent clots, strokes, and other heart diseases. (It was an animal study, though, so take with a grain of salt.) Vodka can also help lower your cholesterol. And, for those watching their weight, it's also generally considered a lower-calorie alcohol. 4. It contributes to oral hygiene. We already mentioned how vodka can soothe toothaches, but swishing a shot of it can help combat bad breath as well. 5. It can alleviate symptoms caused by arthritis. Apparently, patients who suffered from rheumatoid arthritis and had semi-regular vodka drinks throughout the month felt less pain and inflammation associated with their disease, according to this study. 6. It reduces risks associated with diabetes. Unlike beer or wine, a shot of vodka can actually reduce blood sugar levels. This is most effective when taken straight: never has there been a better excuse for a martini. So ladies and gentlemen, do not hesitate! Just order a Grey Goose on the rocks and enjoy the benefits of the vodka. Long, refreshing and effortlessly extraordinary, Le Grand Fizz is an elegant mix of GREY GOOSE® Vodka, St-Germain elderflower liqueur, fresh lime and soda water. Built over ice in a wine glass, it’s the ultimate summer serve. 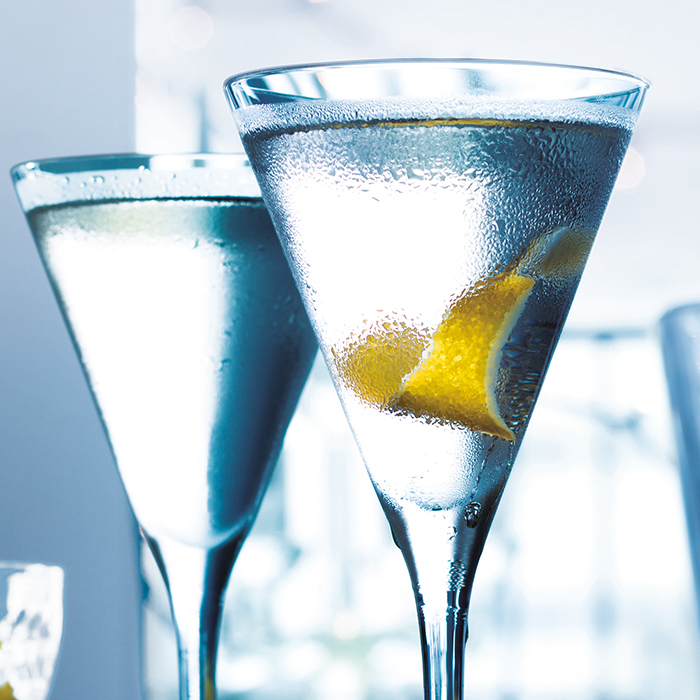 Add GREY GOOSE® Vodka and St-Germain® elderflower liqueur. Then squeeze fresh lime and discard. Stir and garnish with lime wedges and a Grey Goose stirrer. Fresh tomato juice and a rich combination of spices are a zesty complement to the Menton lemon flavour of GREY GOOSE® Le Citron. Build ingredients in a Boston glass. Roll the cocktail by pouring it back and forth between Boston glass and tin. Strain into a highball glass and garnish with fresh cut celery, cracked black pepper and sprigs of aromatic herbs. Use rocks glasses when you want to muddle ingredients in the serving glass, and as a general rule for drinks served over ice balls or cubes. Aim for 6 to 8 fl. oz. If you think you need a double, it means you're drinking two cocktails at a time. Ice melts too quickly for that and dilutes the drink beyond what recipes intend, so buy a single and make the second drink when number one is gone. Cocktails are meant to be enjoyed quickly, after all. Example drinks: Old-Fashioned, Bramble, Negroni. The Collins glass is so closely related to the Highball glass, which is slightly wider and squatter, that you only need one or the other. Because drinks fit for a Collins or Highball glass are served with lots of crushed ice, these should hold 10 to 12 fl. oz. Sometimes used as a measurement for syrupy ingredients–e.g. “one bar spoon of pomegranate syrup”–its main purpose is to stir drinks; 30 cm is the standard length for your standard-sized mixing glass. Too short and your sleeve cuffs will be taking alcohol baths, too long and you'll look like Pee-wee Herman mixing a drink. Unless you're using a mallet and ice pick to chip your own cubes, spring for the ice trays. The 1.25-inch option is standard for ice used in mixing a cocktail. At least a half-liter mixing glass is suitable. A decent glass will be thick enough that a metal bar spoon banging around inside won't shatter it. Just make sure it has a pour spout so that when you serve the drink, you empty it all into a glass and not onto the rug. Buy the Boston type, in which you hold together two parts that look like metal pint glasses. You can make all shaken drinks in these. Skip the cobbler-type with the built-in strainer and cap. It can't do anything better than the Boston shaker, except look cooler. The Hawthorne is your go-to tool for separating cocktails from extraneous ice and ingredient remnants as you pour from a mixing glass. It fits against the rim of the mixing glass like a lid. Japanese jiggers weren't originally Japanese, but when Western bartenders rediscovered their Japanese counterparts using them in the 2000s, they fell back in love with the two-sided measuring tools. They have different capacities on each end, so you can buy half as many as you'd otherwise need. First get a ½ fl. oz. / ¾ fl. oz. jigger. The world's best bars use expensive base spirits. They use Rume, Whiskey and Grey Goose Vodka. Do not forget to grab one Grey Goose limited edition 2018. Last year Grey Goose revealed its first limited-edition bottle in the United States. Celebrating its French heritage and toasting to a festive summer, it was dubbed the “Riviera bottle,” featuring nautical marinière stripes in the brand’s signature blue. For 2018, Grey Goose is continuing the series and has upped its design game by collaborating with illustrator Quentin Monge. The Paris-born artist, whose whimsical drawings are followed by more than 125,000 followers on Instagram, spent much of his childhood near Saint-Tropez. To capture the French Riviera lifestyle, Monge decided to decorate the bottle with blue-and-white striped parasols, a symbol of summer holidays on the French Riviera. The motif also appears on the neoprene sleeve that the bottle comes with, ideal for keeping it cool on a hot, sunny day. And while blue may have been an obligatory color due to Grey Goose’s signature shade, the hue also really speaks to Monge and is often prominent in many of his other works. “For me, when I think about the French Riviera and where I come from, it’s always like this bright blue.” He also states that Matisse and Picasso are two of his biggest influences, both of whom had series focused on blue. Monge’s preference for company is also reflected in his go-to beaches around Saint-Tropez, naming Plage des Salins (his favorite) and Plage de la Ponche in lieu of Pampelonne, the strip most known for its boisterous clubs.